Kaiser Health News highlights a paper out now in Health Affairs that describes a new Commonwealth Fund survey in eleven countries. The results are important, so I’ve made some charts to highlight them. This will likely take a few posts. It will also not compensate for reading the full manuscript, so do so if you’re inclined. This 2010 survey examines the insurance-related experiences of adults in Australia, Canada, France, Germany, the Netherlands, New Zealand, Norway, Sweden, Switzerland, the United States, and the United Kingdom. The countries all have different systems of coverage, ranging from public systems to hybrid systems of public and private insurance, and with varying levels of cost sharing. The survey consisted of computer-assisted telephone interviews of random samples of adults age eighteen or older in eleven countries, using a common questionnaire that was translated and adjusted for country-specific wording as needed. Harris Interactive and country subcontractors conducted the interviews from March though June 2010 (the field times varied by country). The final country samples, shown in Exhibit 2, ranged from 1,000 to more than 3,500. 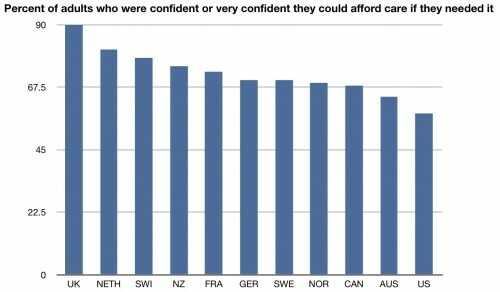 Fewer people in the US were confident that they would be able to afford care if they needed it than in any other country. In fact, 42% of Americans did not express confidence that they would be able to afford care. About one third of Americans report that they didn’t go to the doctor when sick, didn’t get recommended care when needed, did not fill a prescription, or skipped doses of medications in the last year because of cost. 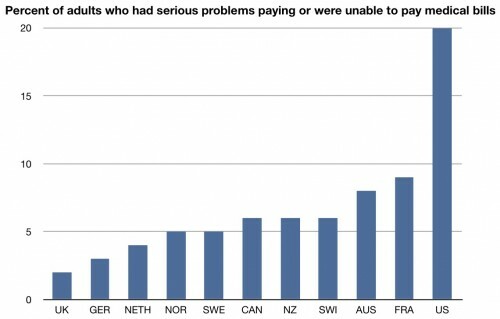 Finally, about one in five Americans had serious problems paying or were unable to pay medical bills in the last year. This is more than twice the percentage seen in any of the other countries. 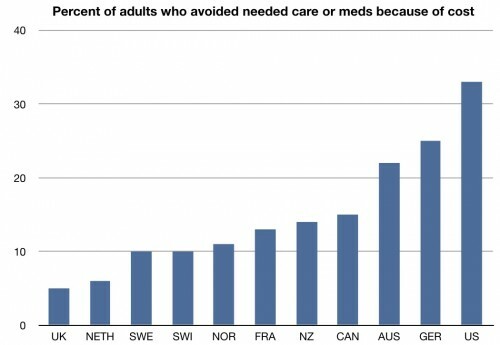 It’s data like these that make me want to scream every time someone blithely says that we have the “best health care system in the world.” This is more than just the uninsured; significant numbers of people in this country have trouble getting care because of cost. And remember – we are spending WAY more than any other country already, and for all that money we’re getting middling to crappy results. Why would anyone want to keep this going unchanged? Here’s the full manuscript: How Health Insurance Design Affects Access To Care And Costs, By Income, In Eleven Countries. Oh I totally agree the system is broken. We offer state of the art quality MRI for 500 dollars out of pocket cost. No where else can you get a 3T MRI study for 500 dollars. Who wants to keep it going unchanged? Since when did basic market forces (to which even socialized systems are subject) get renamed to “rationing”?